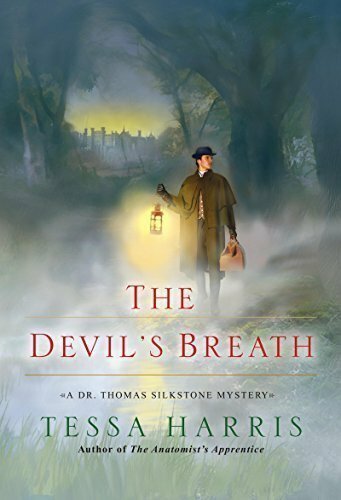 Eighteenth-century anatomist Dr. Thomas Silkstone travels to the English countryside to unravel a tangled web of mystery, medicine, and murder–in this captivating new novel from Tessa Harris. . .
A man staggers out of his cottage into the streets of Oxfordshire, shattering an otherwise peaceful evening with the terrible sight of his body shaking and heaving, eyes wild with horror. Many of the villagers believe the Devil himself has entered Joseph Makepeace, the latest victim of a “great fog” that darkens the skies over England like a Biblical plague. When Joseph’s son and daughter are found murdered–heads bashed in by a shovel–the town’s worst suspicions are confirmed: Evil is abroad, and needs to be banished. A brilliant man of science, Dr. Thomas Silkstone is not one to heed superstition. But when he arrives at the estate of the lovely widow Lady Lydia Farrell, he finds that it’s not just her grain and livestock at risk. A shroud of mystery surrounds Lydia’s lost child, who may still be alive in a workhouse. A natural disaster fills the skies with smoke and ash, clogging the lungs of all who breathe it in. And the grisly details of a father’s crime compels Dr. Silkstone to look for answers beyond his medical books–between the Devil and the deep blue sea. . .